One of the popular brands of pet fountains is one known as Pioneer. While this company is not the largest one making these pet fountains, this company does make some of the best looking and highest quality fountains built in the market place. If you are looking for something that is much more than a simple plastic water bowl that has a pump, maybe a Pioneer pet fountain will be just what you need. One of the reasons this company has caused some separation and division within the market for pet fountains is because of its quality as well as the variety it brings with the many different fountains this company markets. 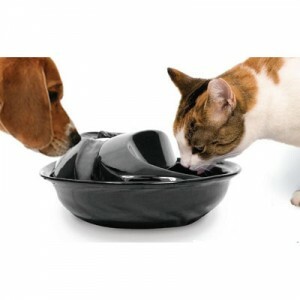 By far, the most popular styles of these products is easily the ceramic pet fountain as well as a stainless steel pet fountain. Just about every other fountain available on the market contains plastic in some kind of form or fashion. Pioneer has now created some pet fountains that can easily be mistaken for a piece designed to be part of the home décor. The ceramic Pioneer pet fountain has certainly become one of the most popular style of these fountains. The teardrop design makes it very attractive and unique, while the nice black ceramic finish enhances this fountains stylish and classy look. This makes the fountain suitable to be placed in virtually any home. Rather than putting out a plain plastic bowl with its simple pump which moves water through a filter, the ceramic fountain will add real substance to the dish. This stylish fountain will look at home wherever it is placed no matter the surroundings. Right in line with the ceramic bowl would be the popular stainless steel bowl. Once again, any person walking into the home could easily mistake this bowl for a lovely piece of the homes décor or art, at least until they happen to see your cat or dog walk up and start drinking out of it! The stainless steel bowl shares the same teardrop style as the popular ceramic fountain and this stainless steel model looks completely at home whatever the surroundings. There are a lot of people who also like this particular fountain because the stainless steel bowl has added benefits, especially when it has to do with cleanliness and health. Basically, bacteria can not survive on the stainless steel surface for as long as it can on many other surfaces. Since, by nature, a pet fountain can attract its own fair share of germs and debris, anything that can help make the bowl a little cleaner or healthier would be a welcome benefit. If you are considering putting a nice pet fountain in your home, be certain that you check out the entire line of pet fountains offered by Pioneer because you will surely find one that will suit your needs, both in style and function.